A cold frame is a simple box structure with a clear lid that you can open and close. It harnesses sunlight to provide a warmer environment than the surrounding garden. While many people use it to extend the growing season or harden off seedlings started indoors, you can also use a cold frame to start germinating and sprouting your spring seeds. Can You Plant Seeds in Cold Frames? With a cold frame, you can start seeds as much as six weeks earlier than you would put them in the ground. You can control the soil content more easily in a cold frame than in an outdoor bed. A cold frame provides the right conditions of moisture and warmth that seeds need to germinate. You don’t need any indoor space to start seeds when you use a cold frame. Start by choosing a good location for your cold frame. It needs sunlight to work, so look for a sunny spot with southern exposure. You can even dig into a southern slope to get sunlight and insulation. Make sure the spot will drain well too, to avoid standing water. Building the structure is pretty simple. You only need four pieces of wood to make the sides and a glass top with hinges and a handle. The top can even be plastic, like an acrylic material, which is lighter and easier to lift. Look for your glass or plastic lid first, as this will dictate the size you need for the sides. Prepare the soil as needed, adding compost or other organic material to enrich it. Plant the seeds according to individual instructions and water the bed regularly to keep the soil moist but not soaking wet. If you get a particularly warm day, prop the lid open to keep the plants from overheating and to allow for ventilation. You can also prop it open to a gradually greater degree as the weather warms in order to harden off the seedlings. Using a cold frame in spring is a great way to start your gardening season earlier. It works well for both flowers and vegetables. 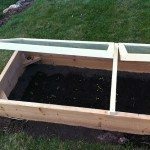 Construction is simple, but you can also find pre-made cold frames online and in some nurseries and gardening centers.